Traditionally, Indiana is not a state known for seafood. However, there is a restaurant in downtown Valparaiso that is doing its best to bridge the gap between our landlocked state and the many seafood delicacies the ocean has to offer. Located on the north side of the downtown Valparaiso square is Blue Point, a restaurant known for its fresh seafood. Blue Point opened in May of 2016 in the site of the former Tommy B’s. Eddie Luick, owner and executive chef, discussed what makes Blue Point a unique member of the Downtown Valpo Restaurant Group. Luick, who has spent the past 26 years working in the restaurant industry throughout Northwest Indiana, has made it his mission to serve fresh seafood from all parts of the world. 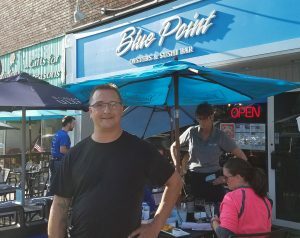 If you are looking for a particular food and drink pairing, Blue Point runs specials that can be found on their website. The Downtown Valpo Restaurant Group is a group of 9 different restaurants run by local restaurant owners, not large corporations. There have recently been several chain restaurants that have either closed their doors, or have announced the closure of some locations throughout the country. Blue Point is located at 13 E. Lincolnway in downtown Valparaiso. You may find them online at www.bluepoint-seafood.com and their Facebook page at www.facebook.com/BluePointSeafood.